Home BANK-EXAM FRESH-VACANCY SBI SBI-PO-EXAM SBI PO Notification 2019 Out for 2000 Vacancies, Download PDF! 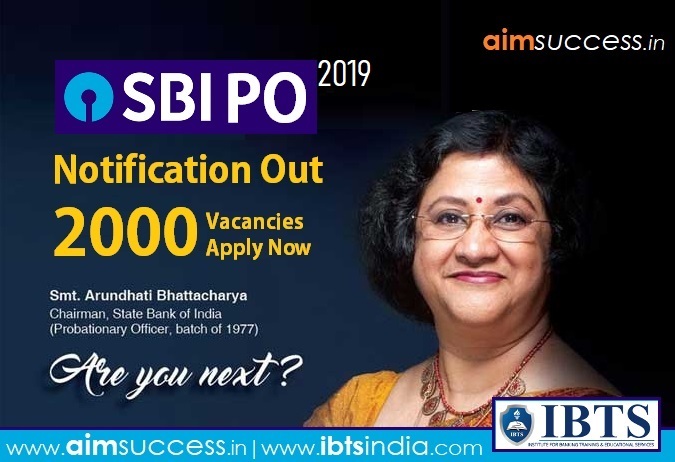 SBI PO Recruitment 2019 - SBI PO Notification 2019 is finally out! The State Bank of India has released the SBI PO official notification 2019 for a total of 2000 vacancies for the post of Probationary Officer. Candidates who are keen to make a career in the banking sector can apply online for SBI PO recruitment 2019 from 1st April 2019 onwards, subject to the fulfillment of the prescribed eligibility criteria. The last date for online application is 22nd April 2019. The online exam of SBI PO Prelims 2019 will be held on 8th, 9th, 15th & 16th June 2019 in various slots. The recruitment process will be held in three phases i.e. Preliminary Examination, Main Examination and Group Exercise & Interview.